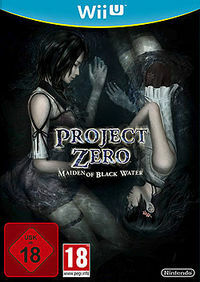 The European box art of Fatal Frame: Maiden of Black Water. Fatal Frame: Maiden of Black Water (titled Project Zero: Maiden of Black Water for its PAL release) is the fifth installment of Koei Tecmo's Fatal Frame series, exclusively for Wii U. While the game is getting a full retail release in other regions, it will be released in North America exclusively on the Nintendo eShop, with the prologue and first two chapters available for free before purchasing the full game as downloadable content. Investigate a series of suspicious disappearances while surviving the haunted woods atop the mysterious Mt. Hikami. The Wii U™ GamePad controller is now your Camera Obscura–used to defend against lethal ghosts. Sample the action from the game's prologue and first two chapters at no cost before choosing whether to purchase all remaining chapters. This entry is comprised of three interconnected stories that converge to uncover the truth behind a recent string of tragic deaths in a forest marred by a history of suicides. As one of three people with the power of the Camera Obscura and the ability to see the shadows of those spirited away, you'll explore the ruins of an eerie inn, a shrine filled with life-size dolls, and a lake full of dead priestesses. Each shadowy location is connected by a stream of water flowing throughout the mountain, and this once-holy water is tied to the darkest mystery of all–the history of death and darkness on Mt. Hikami. Yuuri Kozukata is an employee at an antique shop with the ability to see the "shadow" of objects that she touches. On one day, a girl named Fuyuhi Himino requests that she find her friend Haruka Momose, who went missing in the Mt. Hikami area, where people go during the "witching hour", when the border between the living and shadow worlds is blurred, to commit suicide, so that their spirits do not linger between worlds. Yuuri takes up the task and heads to the mountain to find her before she can commit suicide. Players explore a haunted setting inhabited by ghosts, which are defeated by taking pictures of them. In this game, players use the Wii U GamePad as a camera, aiming with the gyroscope. Players can also tilt the GamePad to deal more damage. A bonus mission is also available, in which players control Ayane from the Dead or Alive series and must evade the ghosts as they look for their target, as Ayane cannot damage the ghosts. ↑ Fatal Frame: Maiden of Black Water on Nintendo's Japanese website. Retrieved August 29, 2015. This page was last edited on 6 October 2016, at 03:05.